Mandatory orientation will be held on 4/6/19 at LA Southwest College. 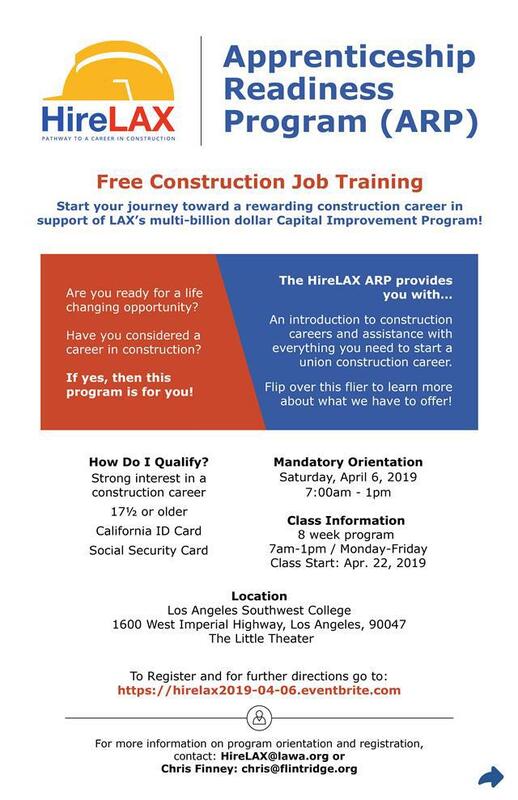 Free eight week training program teaches local workers the skills necessary to become union apprentices on LAX construction projects. "At LAX, we are in the midst of a major transformation and we are committed to ensuring that local workers are part of all of our construction projects," said Samson Mengistu, Chief Operating Officer, LAWA. "Our HireLAX pre-apprenticeship program provides local workers eager to work in construction the training and support they need to embark on a new and exciting career and have a hand in building the future of Los Angeles." "Los Angeles Southwest College is honored to again instruct the next HireLAX Apprenticeship Readiness Program cohort on our campus," said Dr. Seher Awan, President, Los Angeles Southwest College. "With so many substantial building projects in Los Angeles, we believe our local community members should benefit from the opportunity to work on these construction sites. The HireLAX training will ensure that those committed to this program will be best prepared for these life-changing opportunities." Contractors performing work on LAWA projects must meet or exceed 30 percent local participation with a workforce that reflects the diversity of Los Angeles. The HireLAX program trains local residents to earn these jobs. 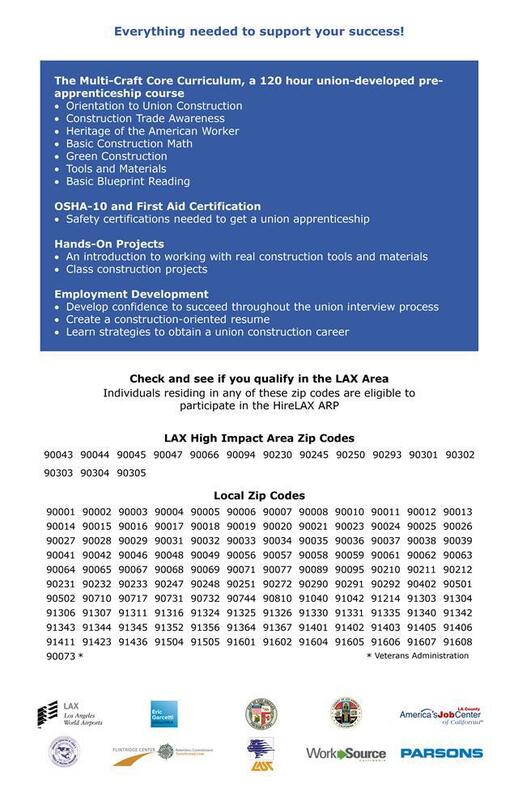 Under the HireLAX framework, program graduates will be connected with union apprenticeship programs and contractors, so they can begin their construction careers at LAX. "We are looking for new members," says Ron Miller, Executive Secretary, Los Angeles/Orange Counties Building and Construction Trades Council, the umbrella group that organizes 48 local unions for skilled craft workers. "With HireLAX, we have a proven track record of bringing community members into the apprenticeship programs of the Building Trades. This puts them on course for lifelong careers with good wages and benefits, and the satisfaction of a job well done. Our partnership with LAX and its contractors continues to generate ambitious projects that create demand for the most skilled and trained workforce. HireLAX helps us grow that workforce." Since the program's launch in 2017, four HireLAX classes have graduated a total of 112 students, 58 of whom are local residents of the Airport Impact Area. Seventy percent of the graduates are now in union apprenticeship programs and have earned local construction jobs. More than 28 percent of the graduates are women, 63 percent are African American, 41 percent are Hispanic, and more than 41 percent have had previous involvement with the criminal justice system. The HireLAX program was developed within the framework of LAWA’s Project Labor Agreement (PLA), which is a partnership between LAWA, its contractors and the local construction unions. The PLA requires contractors and unions to refer local workers to the project and to conduct outreach to persons who have not previously qualified to be employed on construction projects, especially minorities and women. The LAWA PLA and the HireLAX Apprenticeship Readiness Program are managed by Pasadena-based Parsons Corporation. Additional support services are provided by the County of Los Angeles and the City of Los Angeles at their America's Job Centers and WorkSource/YouthSource Centers. Nonprofits Flintridge Center, 2nd Call, and the County of Los Angeles and City of Los Angeles support services network provide comprehensive case management for students and graduates. Those interested in participating in the HireLAX program must attend a mandatory orientation and participate in an application process and interviews. For more information, contact Christina Watkins at (424) 646‑7192 or [email protected] . A short video that highlights the incredible impact HireLAX has on its graduates can be found here: https://www.youtube.com/watch?v=S0pGl9LYq70.